I have some awesome tips for you. First, mix your dry ingredients—whole wheat flour, ground flax seeds (I’m not sure this serves a purpose other than health; I’ll let you know when I run out of flax seeds and have to start experimenting), oats, baking powder, salt, and cinnamon. Then, put an open container of honey next to the dry ingredient bowl. Scatter some dried apricots on a cutting board. This is what we in the business call a bad photo. 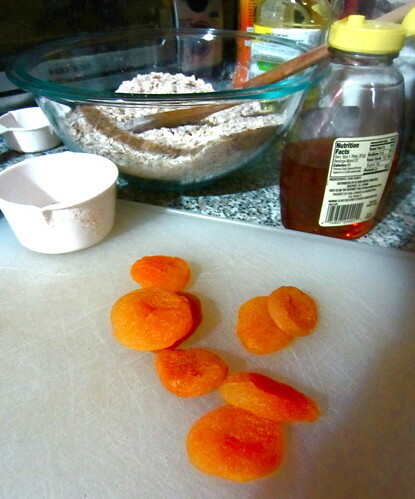 Chop the apricots into small pieces. (I think I chopped each apricot into six pieces or so.) Apricots are sticky and this is rather difficult. 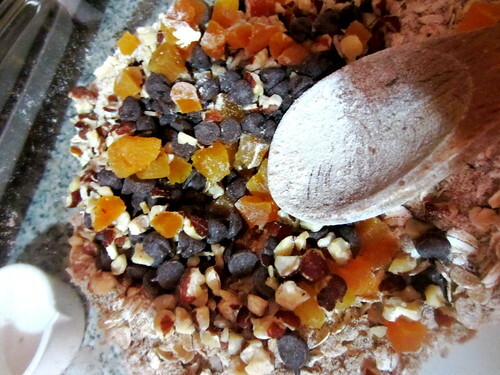 Add your chocolate chips, dried fruit, and nuts (I love hazelnuts; use whatever you like) to the dry ingredients. Add 3 tbsp canola oil. WITH THE SAME TABLESPOON, add 2 tbsp honey. This way the honey will just slide out of the tablespoon; you won’t have any getting-honey-out-of-the-tablespoon crises. It’s awesome. Mix together, then add to the dry ingredients. It’ll be kind of impossible to stir. I’m going to use my hands the next time I do this. 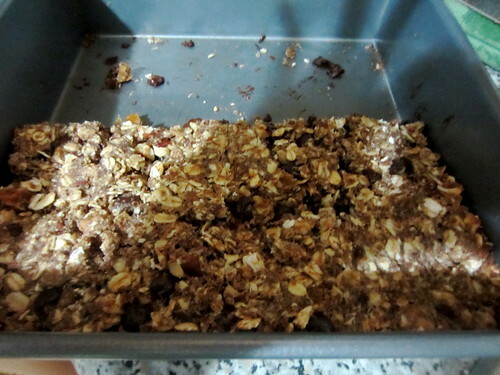 If baking bars, put in a 9×9 cake pan and bake for about 20 minutes. If making cookies (probably the superior option), form cookies, put on a sheet pan, and bake for 12-ish minutes. 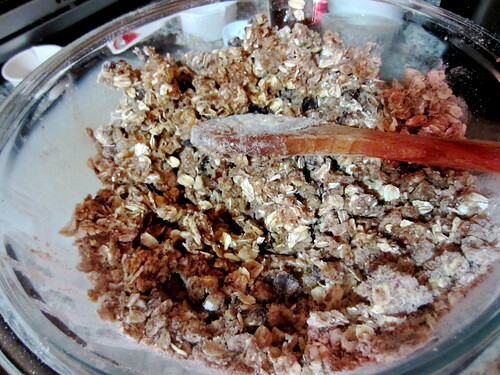 Mix dry ingredients together, including the add-ins. 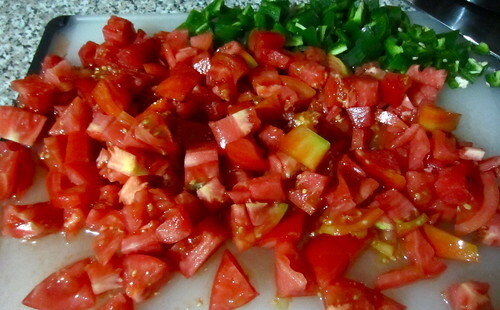 Mix wet ingredients together in a separate bowl, then combine. Bake at 350°, either in a cake pan for 20 minutes or as cookies for 12 minutes. If you intend to keep them around for more than a few days, put them in the fridge. 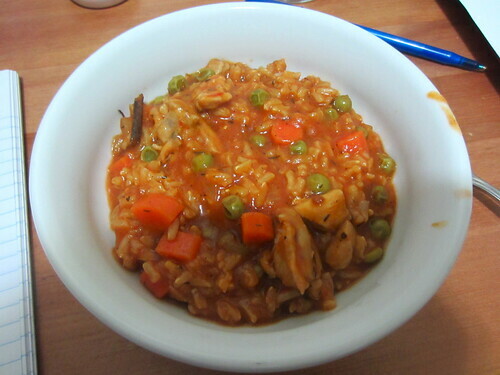 The hardest thing about making this was preheating the oven. I REALLY did not want to preheat the oven. I waited until I had basically finished assembling them, and then decided I couldn’t put it off any longer. (And I even turned the air conditioner on to offset the oven, so now global warming is my fault and I feel bad. Sorry, world.) But anyway, what I actually meant was that these are extremely easy—you just put things in a bowl and stir them. I guess the other hard part was opening my jar of peanut butter, and then getting the peanut butter out; it had been all the way in the back of the fridge and had sort of frozen, or at least really intensively solidified. This is all out of order now. 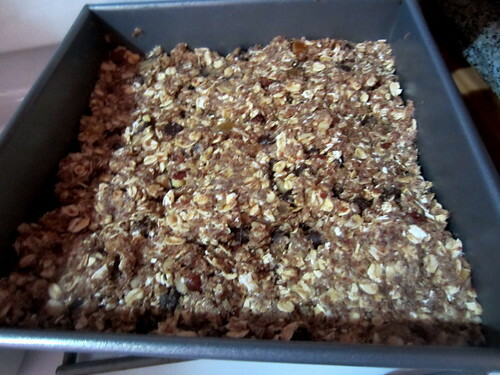 First I assembled the dry ingredients: oats (regular, not instant; maybe this is an unnecessary caveat for everyone but me, who prefers breakfast in 2.5 minutes rather than 6 minutes); whole-wheat flour (store in the fridge or freezer to avoid rancidness); salt; baking powder. 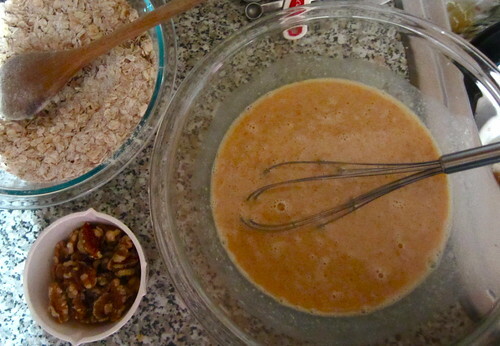 Then I whisked together the wet ingredients—the peanut butter (which did not want to be whisked, but I made it be whisked), sugar (I had to make my brown sugar first, which was annoying), oil (I used peanut because it seemed like it would be less weird than olive). Then I added the egg and then the milk. OMG it just took me eighty billion years to put this photo into this post and now I don’t feel like captioning it. Damn you WordPress.